My Favorite Gifts – Susan | Faddegon's Nursery, Inc.
Forcible bulbs, especially Paper Whites are easy, fast-growing and fragrant with lasting pure white flowers. Amaryllis are big and gorgeous, coming in a variety of colors as well as the traditional Christmas red flowers. You can plant either variety in soil or water, with a pebble bottom layer. We stock single bulbs and kits to make it easy! I love to put fresh evergreens around my bulb vases to give a festive holiday look. In January and February, I like to put them in funky glass containers on a sunny windowsill. The Amaryllis bulbs can be saved for years; they get more flower stems as they mature. These really prove to be the gift that keeps on giving! Flowering plant baskets dressed for the season are by far one of my favorite things and the perfect gift! Filled with poinsettias, hydrangeas, Christmas cactus, fresh evergreens and decorations, the fragrances mingling together are beyond wonderful. From rustic to elegant, large or small, there isn’t a taste that can’t be satisfied by one of Faddegon’s beautiful arrangements! This wondrous hydrangea has rightly taken on the common name of “Shooting Star”. In reality, it’s a Japanese cultivar, “Sumida no hanabi”, which translates “fireworks over the Sumida River”. It looks as beautiful as it sounds! 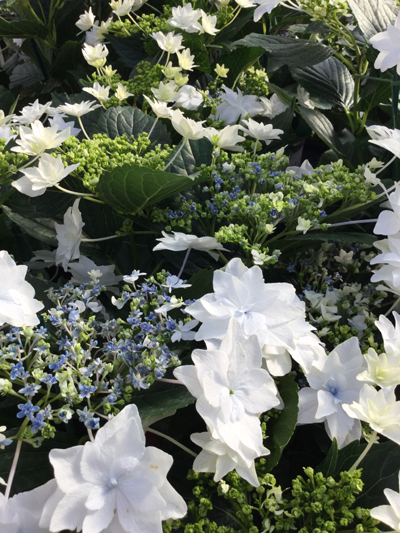 Cascades of star shaped double florets shoot outward over glossy green leaves, in shades of white and blue. Not hardy for the outdoors in our region, place “Shooting Star” in a cool indoor spot with plenty of light. Quickly becoming a favorite, selaginella krausiana, is better known as Frosty Fern. Being a true gardener, I must stop and tell you that this is not technically a fern, but a member of the plant division Lycopodiophyta, a division with us for about 410 million years now! But this isn’t why people love it. Frosty Ferns are a sweet new offering in indoor plants. Only growing to a few inches tall, the impact is much greater. Lacey and soft, the variegated variety of selaginella is irresistible. The color makes a wonderful partner in terrarium and fairy garden plantings or as a companion for any indoor holiday planting. This season you’ll see Frosty Fern potted up and tucked in with all of our other holiday plants. Take him home, keep him moist and spritz with a mister to keep the foliage moist too. If you see him begin to curl his leaves, he needs a little more humidity. If you bring your frosty fern outdoors to enjoy the summer, leave him in a shady spot! For the forgetful or travelling family member or friend, I like to recommend the Plant Nanny. Plant Nanny products help your plants flourish with less work! Start by pre-moistening your plant’s soil; gently insert the terracotta stake near the center of the plant. The shape of the stake allows it to be inserted into the soil without damaging the plant’s root system. Fill the glass globe or wine bottle at the tap then turn it over and insert the globe neck into the stake. This ensures your plants are well watered even if it is forgotten for a few days. Just a glance will tell you when your Plant Nanny needs a refill!